The Hammerhead One is an intelligent navigation device that effortlessly guides cyclists along the safest and best bicycle routes. Cycling has exploded in popularity worldwide, but there remains no safe way to navigate on a bicycle. With Hammerhead, we’re solving these important problems by crowdsourcing the world’s most accurate and up-to-date map of bike routes, and then safely communicating these routes to cyclists in real-time. In addition, the Hammerhead app provides the best social and training analytics platform available to cyclists, compete in real time, share routes, and access the most sophisticated cycling specific training software on the market. The hammerhead system allows cyclists to explore the urban landscape on bicycles safely and without fear. Hammerhead is about discovery. We seek to enable riders to explore the world around them as well as reach their full potential as athletes. From serious athletes to casual riders, the cycling community is extremely fastidious about the technology they rely on. It was imperative that the Hammerhead One not only offer insight and direction to the rider in a safe and intuitive way, but that it did so through a sleek and appealing feature of the handlebars. The world wide cycling fraternity has enthusiastically embraced hammerhead’s minimalist and aerodynamic form. Cycling is a high stakes environment so we looked to the way information is communicated under similar conditions. We learned that fighter pilots land their aircraft at on moving carriers at night through direction from an intuitive light system and decided to develop a similar form of communication for bikers. 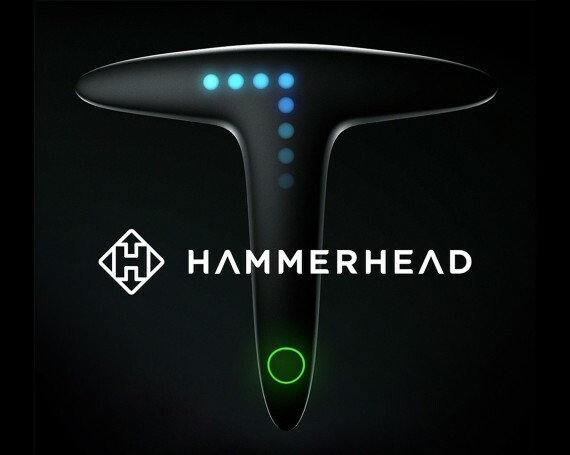 We invented the Hammerhead One, a connected device that pairs with our app to communicate directional information and route metrics to the cyclist through and intuitive light array visible in their peripheral vision. The hammerhead app has three components: First, it harnesses data from thousands of users worldwide allowing bikers to tap into the entirety of the cycling community’s knowledge about the best routes in any given location, and provides big data insights into cycling habits regionally and globally. Second, it has a social dimension, which allows athletes to compete with one another in real time, follow ones another’s progress, and share routes across the community. Lastly it supplies the most sophisticated analysis of training metrics available to cyclists during, and post workout, helping them to reach their full athletic potential.